Australian Marist, Fr Gerard Hall SM, has played a central role in launching Australian Catholic University’s Centre for Indigenous Education and Research (CIER) and the School of Theology 'Indigenous Theology Symposium' held in Brisbane, Jun 20-24. Among other sponsors the symposium was supported by the Australian Province of the Marist Fathers. The symposium hosted a public lecture on ‘The call to get in touch with our origins’ on Jun 20 at the Brisbane Campus at Banyo. Respected Ngugi Elder of the Quandamooka people, Aunty Joan Hendriks, spoke at the event about Indigenous Spirituality. She was joined by Professor Francis D’Sa, a distinguished Panikkar scholar from the Institute for the Study of Religion at De Nobili College, India. 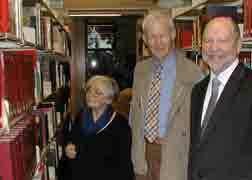 Fr Gerry, Aunty Joan Hendriks and Fr D'Sa were members of the International Spirit of Religion Project 2006-09 under the leadership of Raimon Panikkar, meeting several times in Costa Brava, Spain & Venice, Italy, involving representatives of Eastern (Hindu, Zen Buddhist, Confucian, Daoist), Abrahamic (Catholic Christian, Reform Christian, Sunni Moslem, Orthodox Jewish) and Indigenous (Aboriginal Australian, Guatamalan Indian) traditions on the theme of 'Forgiveness as a Way of Peace'. 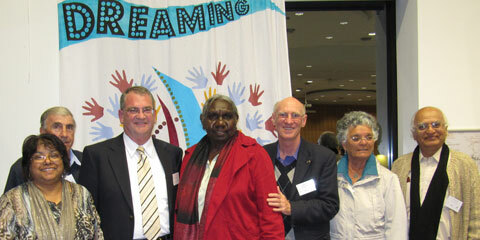 Above, from left: Assoc Prof Nereda White [Director, Centre for Indigenous Education and Research, ACU], Fr Paul Sullivan SM [Koori Ministry, Macksville, NSW], Assoc Prof Rev David Pascoe [Assistant Head, School of Theology, ACU / St Paul’s Theological College, Brisbane Campus], Miriam Rose Ungunmerr [Guest Speaker, Daley River NT – Indigenous Spiritualities], Assoc Prof Fr Gerard Hall SM [School of Theology, ACU / St Paul’s Theological College, Brisbane Campus], Elder Aunty Joan Hendriks [Guest Speaker, Indigenous Spiritualities], Prof Fr Francis D’Sa SJ [Guest Speaker, Vision of Raimon Panikkar, Pune, India]. 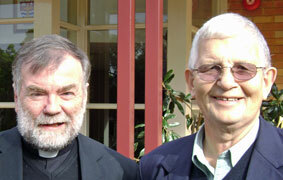 Frs Michael Moore SM and Michael O'Connor SM outside the Seminary of the Good Shepherd, Homebush. Two Marists are amongst the twelve seminary rectors assembled from Jun 21 at the Seminary of the Good Shepherd, Homebush, NSW. They are Australian, Fr Michael Moore SM, Mater Redemptoris (neocatechumenal) Seminary, Perth, WA, and Kiwi, Fr Michael O'Connor SM, Pacific Regional Seminary, Suva, Fiji. The annual three-day meeting of seminary rectors from several Pacific countries provides opportunity for sharing of experiences, mutual support and inservice. Above: MAP participants set out for a glimpse at Davao / Standing at the back row, from left: Frs Gil Casio (Phil), Gavin Foster (Phil), Chris Ganzon (Phil), Lionel Mechavez (Phil), Bob Barber (Aust), Suni Halapio (Oceania), Aliki Langi (Phil), Phil Cody (NZ), student John Gou Wang (Chinese scholastic, Phil) and Fr Lauro Arcede (Phil). Sitting: Frs Paul Donoghue (Oceania), Larry Sabud (Phil), Kevin Duffy (General Administration, Rome) and Paul Cooney (Aust). The annual meeting of Marist leadership in Asia-Pacific (MAP) has been held in Davao on the island of Mindanao, Philippines. Provincial and Mission District leaders reviewed and planned for ways of further collaborating in ministry throughout the four units represented in Asia-Pacific: Australia, New Zealand, Philippines and Oceania. Topics included formation, recruitment and other areas of ministry collaboration and support. Australia has been represented by provincial, Fr Paul Cooney SM, and vicar-provincial, Fr Bob Barber SM and the international leadership team by Fr Kevin Duffy SM (General Administration, Rome). Above: MAP leaders in sessions, from left: Frs Chris Ganzon (Phil), Kevin Duffy (Rome), Suni Halapio (Oceania), Larry Sabud (Phil), Phil Cody (NZ), Paul Donoghue (Oceania), Paul Cooney (Aust) and Bob Barber (Aust). 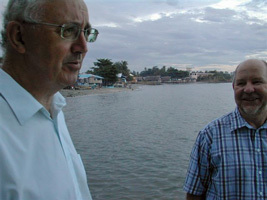 NZ's Fr Phil Cody / young neighbours on the beach at Dumalag. MAP delegates visited the waterside Marist formation community and international novitiate site at Dumalag, Davao. Frs Kevin Duffy and Paul Cooney near the Marist community at Dumalag / Frs Bob Barber, Paul Cooney and Aliki Langi visit the grave of Australian Marist, Fr Philip Callaghan, in Davao. Rosie Payn, Hans Arns, Fr Paul Cooney / Fr Andrew Murray, Dr Gerard Kelly, Fr Paul Cooney. 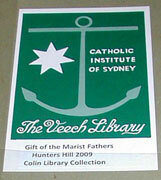 In early June Marist provincial, Fr Paul Cooney SM, vicar provincial, Fr Bob Barber SM and Hunters Hill librarian, Rosie Payn, visited Catholic Institute of Sydney at Strathfield to hand over the ten volume copy of the 'Letters Received from Oceania' by the General Administration of the founder Jean Claude Colin (1836–54) and to be recognised by Catholic Institute of Sydney for a large donation of books from Colin Library at Hunters Hill. The letters are among the first European accounts of the lives of peoples of the Pacific and are an outstanding resource for further research. The hope of the Australian Province is that by placing the publication in Australian research libraries it will be preserved and in time its research potential will be realised. 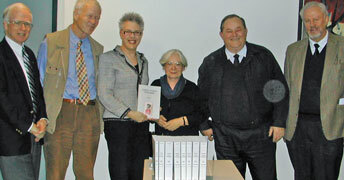 From left: CIS president Rev Dr Gerard Kelly, library advisor Hans Arns, Veech librarian Anne Hocking, Rosie Payn, Fr Bob Barber SM, CIS faculty member Fr Andrew Murray SM. 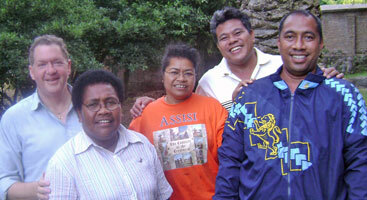 Pictured in Rome this week, from left: Fr Pius Jones SM, (Australia), Sr Mariana Marama SM, (Fiji), Sr Noela Iosefo SM, (Samoa), Fr Simone Ah-Lo SM (Samoa, in Rome for Year of the Priest events) and Fr Patolo Matiasi SM (Samoa). Kiwi Marists, Frs David Kennerley and Chris Skinner, are also on the program, Fr David being part of the international facilitating team. One Australian, Fr Pius Jones SM, is among the twenty Marists experiencing the international Marist renewal program at Manziana, Italy. This week (Jun 11) the participants move to France for a three-week segment visiting the places of Marist origins.Fr Pius is enthusiastic. 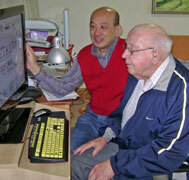 He says, 'It's a real renewal: the best program I've done since I've been professed as a Marist. There are five program members from each of the Marist branches of Marist Fathers, Marist Sisters, Marist Brothers and Missionary Sisters of the Society of Mary. Brother Emili Turu FMS , Superior-General of the Marist Brothers, has given a special message for Jun 06, the 170th anniversary of the death of their Founder, Fr Marcellin Champagnat. St Marcellin Champagnat was one of the co-founders of the Society of Mary, promising on Jul 23, 1816, to form a religious family with branches of priests, brothers, sisters and laity. Fr Champagnat quickly undertook to establish the Brothers' branch in the parish of Lavalla near St Etienne, France. 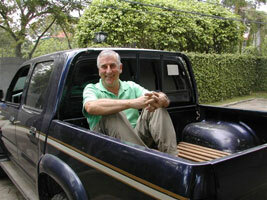 For the rest of Br Emili’s message go to the Brothers’ International web site. The Brothers' have recently announced the appointment of a new leader for their New Zealand Province, Br David McDonald. He will take up his appointment On Dec 19, 2010, coinciding with the reappointed terms of Sydney and Melbourne provincials, Brs Jeff Crowe and Julian Casey. Check the Brothers' web sites on our links page or go directly to their Asia-Pacific provinces of Sydney, Melbourne, New Zealand or East Asia. 'Retired' Marist theologian, Fr John Thornhill SM, is far from retired and soon begins a five-week program, 'Some faith outlines for thinking Catholics', in two Sydney parishes. Recently moved from Brisbane to the Marist retirement community, 'Montbel', Hunters Hill, NSW, Fr John has not let age or failing eyesight get in the road of continuing theological reflections for pastoral ministry. 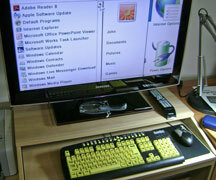 Profiles of the Church: have we got things up-side-down?